I’m still in the pattern. But things are looking up. Yesterday’s flight was MUCH better than last week’s. Weather for a start was much improved – winds light and variable instead of 12 gusting 15kts. It’s amazing how much easier it is to concentrate on the roundout etc without being blown off the side of the runway. The air was smoother too which made handling the plane in the pattern just that little bit easier. We did 8 landings with a runway change from 25 to 07 in the middle of those – much less traffic than last week too and to be honest I’m feeling a lot happier in the plane. I’m making peace with the fact that it’s probably going to take 20hours for me to solo. I read a great article by John Bishop in this month’s Pland&Pilot about how flying simply doesn’t come naturally to all of us. I read this shortly after last week’s below par performance and it struck a chord. The thing for me is that in my head, I was going to be the ‘natural pilot’ who doesn’t struggle. I have the hundreds of hours on flight simulator, lots of online flying time and a good understanding of flight. But the aeroplane isn’t a flight simulator, and I’m realizing now how bad the modeling is in flight simulator. You can’t model control forces easily in FS but what I’m finding the most frustrating is how poorly p-factor and torque are modeled. Full power in the SR20 requires FULL right rudder application on the ground. In FS, the slightest application of rudder sends you off into the weeds – so my right foot is lazy in the real plane. In flight, the merest increase in pressure on the rudder is sufficient in the real aeroplane. In FS, you need to hoof the rudder in a bit more. The net result is that I’m not the sh*t hot pilot I imagined I’d be. This realization has been good for me. I always said I wanted to be safe and not to rush and get the license with the lowest possible number of hours. I’m only flying once a week. I think I’m doing ok. And the best part is that I still get to look out the side window occasionally and think to myself “heck. I’m actually flying this aeroplane!” And that’s a wonderful feeling. The other wonderful feeling is when the instructor turns off the PFD and tells me to look outside, I do a turn and roll out on heading, on altitude and at the correct speed. Attitude flying. I’m getting there. Some days you’re the bug.. It had to happen sooner or later. I had to have a bad day flying. Now don’t get me wrong, a bad day in the aeroplane is still better than a good day at work (or something like that), but my last lesson was a real struggle. By the 9th working day following the meeting I was getting a little twitchy. on the 10th day I emailed the panel member I’ve been communicating with. No reply. On the 11th day, the reply I’ve been waiting for – you have been cleared to fly! I was supposed to receive “shortly” a formal confirmation and the certificate, so I waited and waited. 2 days later, no letter, no certificate, so I phone the responsible person – “oh yes, we’re just waiting for the panel to fax the documents”. Fax? in 2017? #facepalm. Anyhow to cut a long story short, I have in my grubby hands the required medical clearance. Before my lesson on Friday I thought I’d pop into the CAA to apply for a student pilot license which one needs before one can write any exams or go solo. I’ve been assured that this process usually takes 3 working days. Imagine my horror when they say it will be ready in, you guessed it, 7 working days. Hurry up and wait. Le sigh. At any rate, we are making progress, albeit slow progress toward me being in a state of being legally allowed to go solo. Hurdles to be overcome before going solo? Let’s break this down – 01 Sept, 1300Z (1500Local) – Wind 210deg 12kts variable between 160 and 230deg, 25deg celsius. Which doesn’t sound so bad except when you realise that the runway heading is 245 deg – which gives us wind ranging from 25deg from the left to full 90deg from the left at 12kts. Add to this the uphill runway (FALA gains 100ft across the length of the runway) and the high levels of traffic and the stage wasn’t set for a great afternoon of flying. We flew ZS-ZIP which I’ve maligned before as being a bit of a dog, but to be honest, I’m starting to get a bit of a soft spot for her. She’s very docile in the pattern, perhaps not the most athletic of the planes but very useable and forgiving – which is just as well. Every plane I’ve flown on flight sim, and every aircraft I’ve read about flying as a GA aircraft would have one believe that it is important to flare the aircraft before touchdown. Not so the Cirrus. 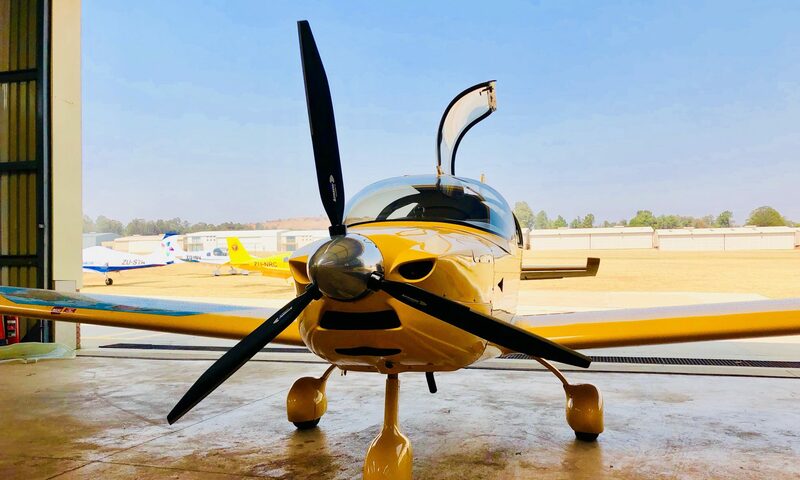 The Cirrus requires you to fly it onto the runway – i.e descend under power, fly into ground effect then reduce power to allow her to gently descend onto the runway. I’m REALLY struggling with this. as the power goes and the airplane slows you need to pull back on the yoke gently to settle her in. I’m a tugger. I cannot get that smooth pull down, and on the odd occasion when I do, I don’t get the power off so she won’t land. we had a number of somewhat positive touchdowns. In my defense the wind was swirling around and we had almost full crosswind at times but I cannot help feeling frustrated, especially when my approaches are really pretty good – despite never getting the same length of final due to ATC/ traffic restrictions – we flew a lot of very short final approaches. My one consolation was when the instructor offered to do a landing just to refresh my technique. As she flew over the threshold she muttered “No wonder you’re battling, it’s horrible”. So we need to find some respite from the wind. It IS the windiest time of the year in Jhb at the moment, but I’m going to try and carve out a morning slot this week to try and get the landings sorted so we can carry on with the circuit emergencies – we’ve only done no flap and 50% flap emergency landings – no engine failure on downwind, no EFATO drills. While I want to believe I’m not impatient to go solo, there is a little part of me that wants to get it done. But really, I’m in no rush…. Below is a video from an earlier circuit session, also in ZIPpy but under much better conditions – with a greaser at the end for good measure. Take it as read that the flying was MUCH worse last time….